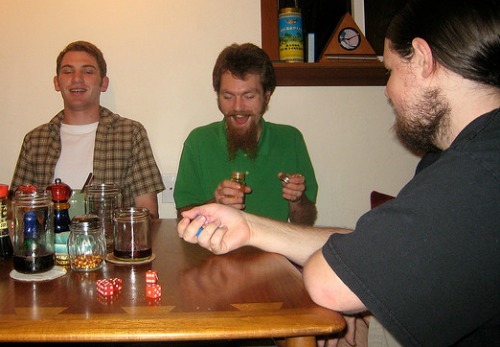 The 3 man drinking game is one of those fun drinking games for your party or for a night out. It lightens up the party and gets everyone buzzed up! It can be played with any number of players. No one was to be left out of the party. Have your friends sit in a circle. The first thing to do is choosing who will be the “three man” by rolling one dice. The first guest to roll a three becomes the “three man”. After this, the game is on a roll! The guest seated left to the “three man” starts, and the dice drinking game proceeds in a clockwise manner. Each player rolls two dice. 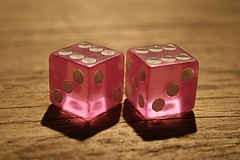 The combination on the dice determines what action is to be taken. 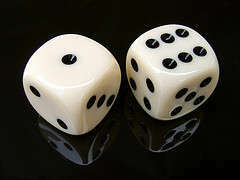 If the player rolls 1:1, that is a double. The player then has to choose two other players among the crowd and hands each one of them a dice. The player with the lower number of eyes drinks as many sips as he is lower. The same is repeated if the dice combination is 2:2, 3:3, and 4:4. Only for each eye less than the other person, the looser has to take 2, 3, 4... sips! Any time someone throws a 3, the three man has to drink! If any player rolls the combination 1:2, he becomes the new “three man”! This dice drinking game has many variations. You should decide on the rules beforehand. If the dice show the combination 1:6, the left player to drink. Any dice combination with the sum of 9: the opposite player has to drink. The “magical” 10 is the best: everyone has to drink! The more “tens”, the more fun the 3 man drinking game becomes. A combination of 11: the left player has to drink. The combination 1:4 comes with a special rule popularly known as the “thumb” rule: At any moment, the player can place his thumb on the table. Whoever at that moment puts his thumb down last, must drink.